__________6. Manny can do a certain job in 1 day, Anna can do the same job in 2 days, and Josie can do the job in 3 days. How many days will it take them to do the job if they work together? __________7. In the figure, all the line segments meet at right angles and each segments has a length of 1 unit. What is the area of the figure in square units? ___________8. If x - 3 = y, then (y - x )3 = _____ ? ___________9. A speed of 90 km per hour is equivalent to how many meters per second? ___________10. A rectangular sheet of cardboard 5 inches long and 4 inches wide is cut into squares one inch on a side. 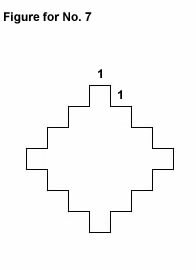 What is the maximum number of such squares that can be formed?